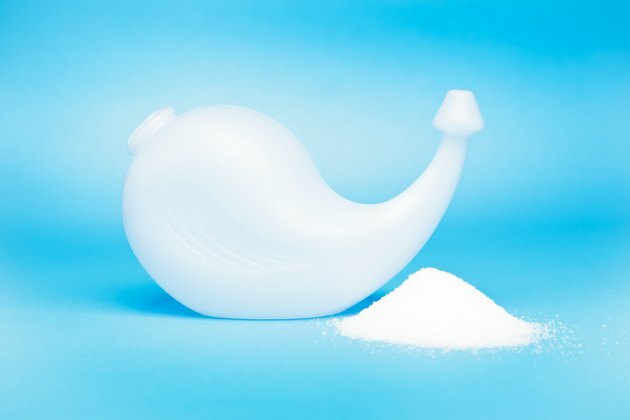 Nasal saline rinse, also known as nasal or sinus irrigation, is commonly recommended to manage the symptoms of sinusitis -- the swelling and inflammation of the sinus tissues. Sinusitis can be related to cold symptoms, allergies or other conditions which cause the nasal passages to become blocked and filled with fluid. An often used tool for this irrigation is a neti pot, which can help flush mucus -- and irritants such as dirt, dust and pollen -- out of these nasal passages. Alternatively, nasal irrigation bottles can be used. This home treatment can offer nasal or sinus symptom relief -- though severe or longstanding symptoms should be evaluated by a doctor. Clean your neti pot thoroughly with soap and water. This is an important step because the neti pot or nasal irrigation bottles can harbor bacteria, and improper cleaning can risk recurrent infection. The Food and Drug Administration (FDA) recommends that distilled, sterile or boiled and cooled tap water be used to clean neti pots or any other devices used to provide saline rinses. The pot should be air dried or dried inside with a paper towel. Wash your hands. Mix together 1 teaspoon of non-iodized salt with 2 cups warm water in a clean glass. Adding salt to the water helps prevent irritation when the fluid goes through your nasal passages, because the added salt makes the rinse more similar to your own nasal and sinus fluids. Add a pinch of baking soda, a buffering agent that also helps prevent irritation. Alternately, you can use a commercial salt made specifically for neti pot use. Stir the solution with a spoon until the salt and baking soda dissolve into the water. Place the mixture into the clean neti pot. According to the Food And Drug Administration (FDA), nasal or sinus irrigation involves these steps: -- Lean over a sink and tilt your head to one side, so that your ear is facing the sink. Your forehead and chin should be level to prevent liquid flowing into your mouth. -- While breathing through your open mouth, place the spout of the filled neti pot into your upper nostril. The liquid will drain through your nasal cavity and out your lower nostril. -- Blow your nose, clearing our nostrils, then rinse out the opposite nostril by repeating this procedure on the other side. According to the FDA, tap water should not be used for nasal irrigation unless it has been boiled for 3 to 5 minutes, then cooled, or unless the water has passed through a filter with an absolute pore size of 1 micron or smaller. Sterile or distilled water is preferred, and available in stores. Using the correct water to both clean and fill the neti pot is a critical step in making nasal irrigation safe. An article published in the August 2012 issue of “Clinical Infectious Diseases” reported 2 deaths linked to the use of tap water in neti pots. Both people died from primary amebic meningoencephalitis, a brain infection caused by an amoeba in tap water. An article in the October 2010 issue of “Laryngoscope” also noted that contamination of nasal irrigation devices, such as neti pots, is was found in more than half of the study subjects -- a problem that can be prevented with proper cleaning methods. If you have frequent or long-term sinus or nasal congestion, talk to your doctor to inquire if nasal irrigation will be helpful and safe for your condition. Young children may not tolerate the procedure as well as older children and adults, so if you think your child would benefit, talk to your child’s pediatrician for advice on the use of nasal rinsing. While the use of the neti pot for sinus rinsing can be slightly uncomfortable at first, the treatment should never cause pain. If your symptoms are not improved, or if they worsen after nasal rinsing, talk to your doctor. If you have a fever, nosebleed or headaches after the use of your neti pot, see your doctor. Finally, don't add medications or other ingredients to your neti pot solution unless approved by your doctor. U.S. Food and Drug Administration: Is Rinsing Your Sinuses Safe?